The Collège du Mont-Sainte-Anne launches a new e-sports school concentration program! Our Competitive Concentration Program in Esports is paving a long way to Estrie! Sherbrooke, February 4, 2019 – The Collège du Mont-Sainte-Anne Education House is proud to innovate while respecting its values. Indeed, as of the beginning of September, the College will set up a new program of school concentration in electronic sport (Esports). With the development of young boys athletes wishing to evolve in the world of video games at heart, the program of the “Marquis”, will be realized in partnership with the Academies Esports Canada, specialists in the field! A program of 1800 hours over 5 years (360 hours per year), which reconciles studies and video games. Access to high level facilities with new generation computers, as well as professional coaches. Training, participation and competition in individual and collective video games. Learning the safe practice of video games. Participation in physical activities twice a week (in addition to physical education classes). The new Collège du Mont-Sainte-Anne program aims to foster the development of future high-level e-athletes in Quebec under a structure that will promote our values ​​while also promoting academic success. The primary goal of the student-athlete is graduation. There will be an information meeting on February 26, 2019 at 19:00 in the College or live on the College’s Facebook page (https://www.facebook.com/collegemsa). Le Collège du Mont-Sainte-Anne is the only French-language high school exclusively dedicated to teaching boys. Inaugurated in 1948, it provides education for boys from all walks of life. Residence cchool and day school, it offers an elite hockey program, basketball, hunting and fishing and now electronic sport. In addition, international education and entrepreneurship programs tie in with the boys’ pedagogy developed at the College. Electronic sport to teach healthy lifesyle, academic success, counter isolationism, cyberaddiction and prevent school dropout ! Such a program has the same benefits for participants as traditional sports programs. Improvement of physical and psychological health, socialization, reinforcement of the sense of belonging (team spirit), increase of self-motivation and reduction of school dropping, to name only these. Coaching and education are great ways to prevent cyberaddiction and cyberbullying. Our program promotes a healthy and structured practice of video games, which did not exist at the time. You can read a preview of the Program Structure offered at École Edouard-Montpetit and this structure will be similar to our other partner institutions such as Collège du Mont-Sainte-Anne. Students will go to their regular school in the morning (or afternoon) and travel to the Academy for their esports training in the second half of their school day. On September 14th, 2018, the Montreal Esports Academy (MEA) has announced with an immense enthusiasm the launch of the very first 100% Esports-Studies Program in Canada. This program, launched in collaboration with the Édouard-Montpetit High School of la Commissions scolaire de Montréal, is a major step forward for the growth of esports in Quebec and Canada. The famous Hashtag <# Esportsétudes> spread like wildfire in social networks during the first hours in from the United States of America to the shores of France (French only). The Edouard Montpetit high school received a correspondence from le Ministère de l’Éducation et de l’Enseignement supérieur, in October 2018, to follow up proper appellation and, hopefully, the ministry will be listening to our young people through us for their development on this global phenomenon in which Quebec could be a potential leader! On October 30th, 2018, the Montreal Esports Academy (MEA) has announced that his first group of 12 students in competitive concentration in electronic sport was filled and that a second group would be created for Fall of 2019. Some inscriptions remain open for the Open Doors of April 2019. 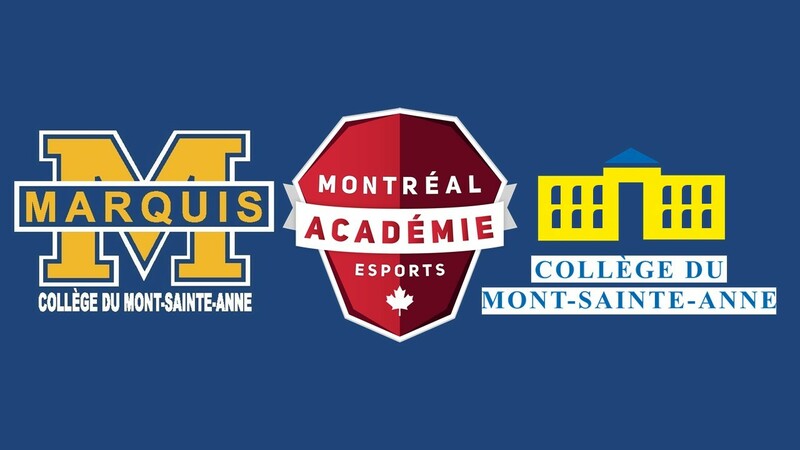 On February 4, 2019, the Montreal Esports Academy (MEA) announces its partnership with le Collège du Mont-Sainte-Anne for a an Esports Competitive Concentration (ECC) for its students in the city of Sherbrooke. On February 23, 2019, the Montreal Esports Academy (MEA) will announce its next big news during the First Esports Initiative of the Montreal Canadiens : the NHL19 tournament presented by Bell to be held at the 1909 Taverne Moderne, rebroadcast live on Twitch.tv/mtlesports and at the Marché Bonsecours Square at the launch of the Montréal Joue activities. Our program is the first in Canada to offer instruction focused on the healthy practice of video games and to do so in a formula equivalent to the various traditional Sport-études programs in Quebec (French only). It is therefore through our unique approach that we can differentiate ourselves from electronic sport concentration programs or other similar programs. In addition, our program is 100% e-sports and does not include computer programming, art or other non-related to the pure development of an e-athlete who wishes to win the first place on the podium at eSports tournaments in Canada and around the world. It is important to note that our program is not a Sport-études program. This nuance is very important because, unfortunately, the fact that esports are not recognized as a sport in our province is blocking access to all government programs such as Sport-études. La Fédération québécoise des sports électroniques is actively working to make e-sports a reality, as it is already the case in no less than 22 countries, and another 24 countries will soon follow. The 7th Olympic Summit, held in Lausanne, Switzerland, in December 2018, further examines the issue with a view towards the next 2020 Olympics in Tokyo, 2022 in Beijing, and 2024 in Paris. Tokyo is the cradle of video games while Beijing and Paris are all e-sports bastion cities in their respective region, so the wind is on the sails for our youngest e-athletes!